I imagine that the skill level of the doc is one determining factor. If he is fresh from medical school/newly commissioned, it might not be that useful. If the doc is more seasoned it might be useful for minor surgeries, I&Ds, circs, various lacerations and maybe a bit of plastic surgery. I`d be worried if the doc were to attempt something more ambitious such as a lap or appendectomy. Likewise the nurse assigned – hopefully they would be ER or OR inclined. The old Hamilton Class WHECs had a doc (USPHS) aboard at first and the ship was equipped with an x-ray unit. Both were later removed in favour of IDCs and no x-ray capability. When I was doing training assessments in BOUTWELL and other WEHCs of that class, the remnants of the x-ray unit were still in visible. Interesting article! 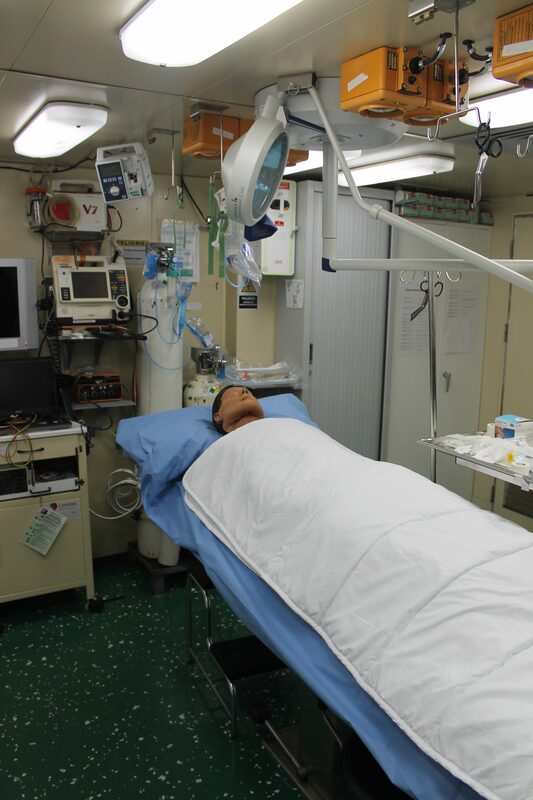 When I was U.S. 5th Fleet Surgeon (2008 – 2010) we had an 8-person surgical team with transportable equipment called the Expeditionary Resuscitative Surgical System (ERSS) designed to provide damage control surgery in case we had some casualties during our counter-piracy operations. They could basically go aboard a small ship and covert any room with running water and electricity into a surgical suite. We had two teams; one in the Red Sea and one in the Arabian Sea. Thanks for this informative comment. One hopes the Spaniards’ planning is enlightened. As for blood supply, my friend Helmer (Scott) Huseby, then CO of our Navy’s first field hospital in Vietnam, relates as to how no blood banking program existed at the time so he had to institute a “walking blood bank” program – that is, a database of all personnel blood types so people with needed types could be called in for what would essentially be “warm transfusions” – until the Navy put a banking system in place. Did you have that capability as a back up? Best to you in Kathmandu!